After May 19, 2009, my health continued to decline and I watched the paralysis take over my body. I remember the chicken broth that tasted like ramen, I remember my sister joking with me about sounding drunk as I slurred my words increasingly worse, I remember when swallowing became too hard. I was eventually given the IVIG treatment. I could still somewhat hold a pen and whoever was with me would move the pad of paper under my hand as I wrote down letters. I remember the morphine, I remember sitting on a hill staring at the starry night sky in incredible peace with a figure next to me, I remember scribbling out a message to my father that he quickly pushed away. I guess that is when my body started on the upswing. It took about three weeks from onset for my body to turn which is about typical (if there is any semblance of typical with GBS...) I bounced around between ICU a bit but finally around May 26th is when I was on more stable ground again. 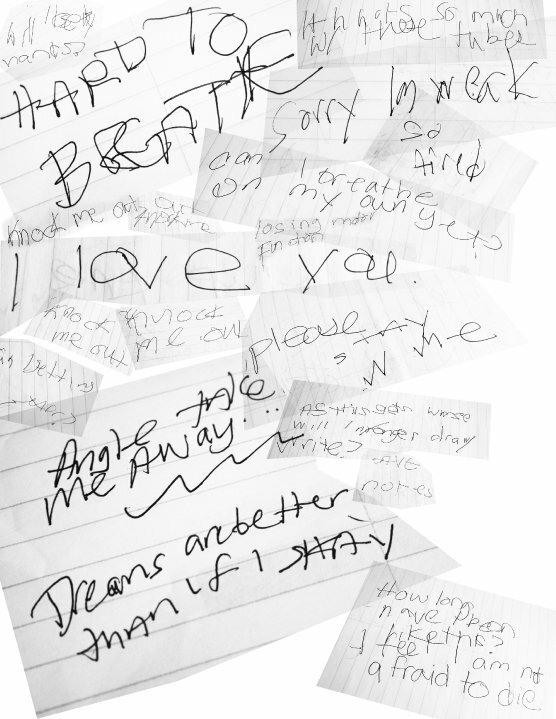 The photo is a collection of some of the notes I wrote with the help of people moving the pages for me.